These are great. You don’t have to find someone to help you move the mattress to put them on! I can’t wait to try them out. I ordered 2 pairs for two different beds of mine. Changing your bed skirt has never been so quick and easy! 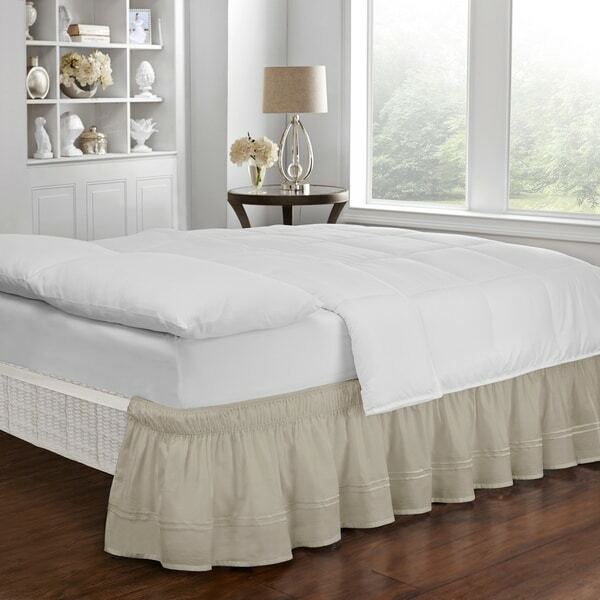 This beautiful bed skirt adds the perfect touch of charm and finished style, without having to lift a heavy mattress. The easy-stretch design allows it to slip effortlessly over your mattress and around your box spring. I ordered two twins to put on our king adjustable beds and they work perfectly. No pinning or adjusting needed. 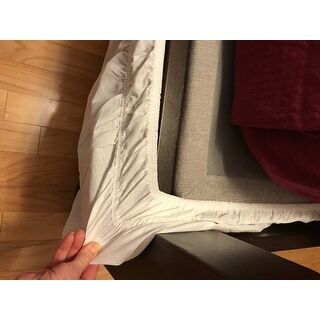 I put the part of the elastic that has no material on it in between our split mattresses so as we raise and lower the head or foot no part of the skirt is there to have to be re-tucked. The fabric is true to the color on the website and the material is not too thin. We are very pleased and would buy these again. I have an adjustable bed and I have looked forever for a decent bed skirt! This is truly amazing ! I can put my bed in any position and it stays in place. It was so easy to put onto bed platform and that's saying a lot as I'm disabled. It looks terrific too. I think the style matches perfectly with any decor but I chose white as that meets my color needs. This is really a lovely bed skirt and I am so glad I took the chance to try something new. Thanks again Overstock! 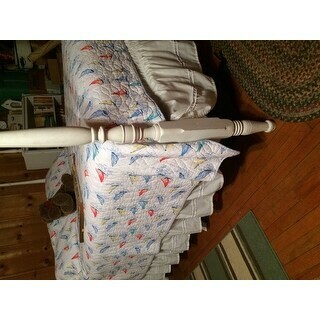 Not for use with bed frame posts. So easy to put on. Seems shorter than 18 inches because of design...elastic is a couple inches down from top of skirt. 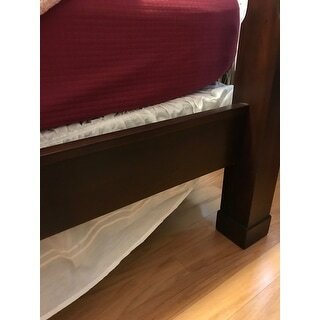 Finally a bed skirt that does not creep & fall when we use our adjustable beds! Photo is very accurate, colors near the color charts. The grey works great with our linen colors. It is easy to fit. So happy to find an 18 inch drop bed shirt. Beautiful color and material. Would definitely recommend. Disappointed, I ordered white and even tho the pkg says white it is a ivory/lt beige color. Pkg says the drop fits 16-18 inches. My drop is 16.5 inches and it is still about 1 1/2" too long...dragging on the floor. It also slips and needs to be readjusted when I change the sheets. I do like the stripe around the bottom, that is why I bought this one. I will use it for now but will be searching for another. I used this to go around my king adjustable bed. Looks nice would recommend. I ordered two twin in white for our adjustable king bed. Just received them. They are an ivory or off white with bright white stitching. All my bedding is white. I checked the package and it does say white on the package:( Not sure if I will keep or send back. I may wash with some bleach and see if that helps? Don’t buy if you want a true white bed skirt.It is also 68% polyester,32% cotton it states on the package. So happy to find this. With the mattresses getting thicker all the time, the average bed skirt won't nearly reach the floor. This worked great and the bonus was not having to lift the mattress to put it between that and the box springs. I used it for a queen size bed and it was still a little large going around the base of the box spring. I just took up some slack with pins. This is easy to put on and take off. I would like to see more colors. This is the perfect answer to my adjustable platform bed. We have the Zero Gravity bed, this is so perfect for the bed and easy to put on, and off. I had hoped this would work on my malm bed from Ikea and it does. I gave it 4 out of 5 because it'd be perfect if there was a way to tighten the slack. Something like the slide things on bra straps would be perfect. It's pretty, doesn't look junky or cheap and does a good job on a king platform bed. Fit perfect. Easy to put on. I have an adjustable bed that could only accommodate this type of bed skirt, so I ordered it. I used it for a month or two but ended up taking it off my bed because it wouldn't stay in place and I constantly had to adjust it. It would either bunch up or drag on the floor and it ended up being quite a nuisance. What I’d looked for at all our local markets and was unable to find. 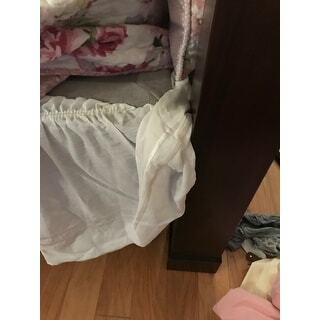 "One review said that the white bedskirt isn't really white. I'd appreciate knowing if others who ordered the white also see it as being off white with white stitching before I order mine because I need true white." I got the white and grey. Exactly as advertised..
"details state 15 and 18 inch drop..is the bed skirt adjustable ..i need a 16 inch drop..."
"Does this really fit a king size mattress? Some that day wueen/king don't actually got all the way around." I bought it for my double bed, but it slips all the time. Not sure if it would fit a King. I got one for my double bed , a platform adjustable and it's been Great! Not a single slip! Yes. We have a King and it fits perfectly. The Easy Fit Baratta Bed Skirt is made of 100% cotton. "Are the bottom corners split to accommodate a footboard?" No its one long gatherd piece attached to elastic. Its very easy and pretty too! "Most king dust ruffles are 72 ins. Does this 60" really work for a king size mattress?" I bought this because my new adjustable platform bed would not work with a standard dust ruffle due to the contortions that the mattress makes. My bed is the equivalent to a king, 2 Twin XL mattresses/frames. It was so easy to install this one and it has plenty of stretch, like putting on a headband. It should be plenty large for any king size bed.